This tower is the place closest to the sea you will ever sleep. This unique holiday apartment is situated in the lovely coastal town Huisduinen. This former coastguard tower has been transformed into a stunning apartment with a spectacular view across land and sea. Suitable for six people. The apartment is located on the second to fifth floors of the former coastguard tower. The original character of the apartment was kept in the renovation, giving you spectacular views from everywhere in the apartment. The fifth floor is the place, once you've arrived, you will never want to leave again. From the sofa on this floor, you can take your binoculars and search for seals every day. To your right, you will see the island Texel in all its splendor. Through the patio doors, you access the balustrade, which was built to encircle the tower. Shops and a supermarket are located 3 kilometers away. While the tower is a great place to cook, it is tempting to go out to eat. You will find several restaurants in your close surroundings. After a walk on the beach, one of the beach pavilions is a lovely place to be. 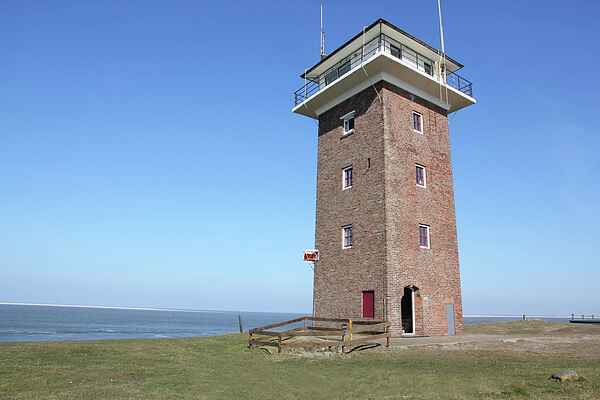 Also visit Fort Kijkduin!